Smashwords offers three primary navigation elements for your ebook. In this post I discuss the linked Table of Contents, as this is the most common method of navigation (and it’s the easiest). Also included in this post is the Non-ToC intra-book links. A linked ToC will benefit your readers (making it easy for them to navigate your book), and I highly recommend including one in your book. If you have sections at the end of the book such as “About the Author,” “Connect with [Your Author Name],” or “Other Books by [Your Author Name]” (I recommend your book include these sections because they offer you powerful marketing benefit). NOTE: If your chapters are only labeled, “Chapter 1, Chapter 2, etc.” and you don’t have additional sections at the end, then there’s little need for a ToC inside your book. In this case, Smashwords can automatically generate the NCX (ePub table of contents) from your “Chapter X.” headings. Planning your ToC: If your book has dozens or even hundreds of individual sections, avoid the inclination to link to every single item. A ToC with too many items can be a confusing experience for your reader. Sometimes, less is more. Consider linking only to major section headings. Also consider how the reader will read your book. Fiction is read serially, from word one forward. If you’re including free sample chapters of your other books at the end of this book (often a good idea), link to the start of your free sample from your linked ToC. A Table of Contents (ToC) makes it easy for your reader to see, at-a-glance, the major chapters and sections of your book. You will manually build your ToC inside your manuscript immediately following your title/copyright page and immediately preceding the start of your book. Smashwords have a video that walks you through most of the steps in adding navigation to your ebook. How to Add Navigation to Your Smashwords Ebook. If you already have a ToC, make sure it doesn’t have page number references. Page numbers are irrelevant to ebooks because the page count of your book will change based on the size of the screen, the size of the font the reader selects, or even how the reader holds their ereading device (on the iPhone, for example, a book might be 200 pages in portrait mode (holding vertically) and 350 pages if they hold the phone horizontally in landscape mode). For your Smashwords ToC, you’ll use the Insert > Bookmark feature, and the Insert > Hyperlink feature. Warning: Make sure you didn’t previously build your ToC using Word’s auto-ToC generation feature because it utilizes field codes and that’s not the right approach. First, create your ToC where you want it by typing it out. The ToC goes at the start of your book, immediately following your Title and Copyright pages, and preceding the start of your Prologue, Preface or first chapter. As you type out your ToC items, make sure your text is in the Normal paragraph style, just like the rest of your Smashwords document. DO NOT create your ToC in the Heading style. Avoid adding empty paragraph returns between the lines to build separation between the TOC items, and only add items you intend to hyperlink. HINT: You can create your ToC using Word’s auto Table of Contents feature (remember to turn off the Show page numbers option). Then select your ToC and paste it into Notepad (or another text editor). 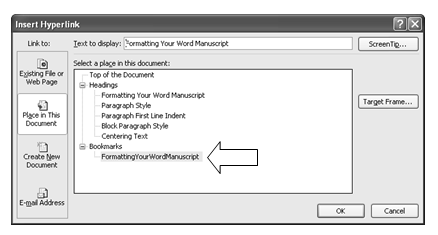 You can then delete the auto ToC in Word, and copy the plain text ToC from Notepad into Word – this will save you the time to type your ToC. You can left-align it or center it (see this post for centering text). Never indent your ToC more than one inch (2.5cm). Next, we are going to use Word’s Bookmark feature to make your ToC clickable. NOTE: Think of the bookmark as your target – it’s what you want to link to. It’s the destination for the reader after they click the link in your ToC. If prior to starting your ToC-linking adventure, you changed your chapter and section headings to one of the Heading paragraph styles, such as Heading 2, then these headings will probably appear as bookmarks when you go to select a target during the hyperlinking process. Do not link to Word’s auto-generated Heading bookmarks. It’s better to create your own Bookmarks. Make sure you have Show/Hide turned on so you can accurately apply the bookmark. As mentioned above, DO NOT place the bookmark above or below the target, and NEVER apply a single bookmark across multiple paragraphs. With your chapter heading selected, click the Insert tab. Type the Bookmark name (to make it easier to remember, use the actual chapter name, e.g. FormattingYourWordManuscript). Bookmark names cannot have spaces or odd characters. Use only alphanumeric characters (the letters a-z or the numbers 0-9). Make sure the Sort By: Name radio button is clicked. 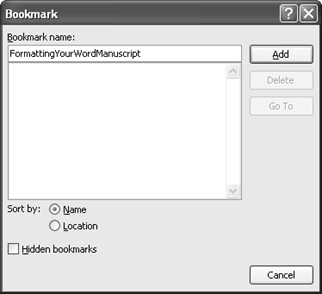 Word will then display your list of bookmarks in alphabetical order. Repeat this step for each of your chapter headings, as well as for other matter in the book like bibliography, epilogue, prologue, etc. as you see fit. Click the Bookmark button, and label this last bookmark something like “ref_TOC” (by preceding the bookmark name with “ref_” you’ll help prevent Smashwords from duplicating NCX items). This will allow you to link all your Chapter headings in the body of your book back up to the top of the Table of Contents. DO NOT highlight your phrase, “Table of Contents” and link it to the bookmark of itself. This can cause problems, and it’s not necessary because there’s no value for the reader to link to where they’re already at. With your bookmarks set, the next step in the process is to create the hyperlinks to your ToC. Click your mouse pointer at the place where you want to start your ToC entries – as it is your first entry; place your pointer directly below the Table of Contents heading. All items in your TOC should be hyperlinked. The text string you select and hyperlink in the ToC is the same text string that will appear in your NCX. Click the Place in This Document button under the Link to: section on the left of the window. Click the bookmark that corresponds with your chapter under the Bookmarks group. 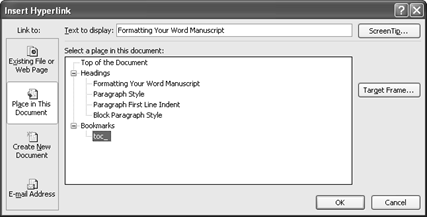 In this example it is FormattingYourWordManuscript. Add spacing between the words in the Text to display field (see example below). Your bookmark text will display at the position where your pointer was (see example below). Now you can link your chapter headings in your book’s body content back up to the table of contents. This makes it easy for the reader to jump back up to the top of the book. From your ToC, press and hold the CTRL key while you click the ToC hyperlink, to jump to your chapter or section heading target. After you click from your ToC to the chapter’s bookmark, select the chapter text (remember, select only the chapter text). Click the Hyperlink button. Click the “Place in this document” button. The bookmarks will display in the main window. Click the bookmark labeled “toc_,” assuming that’s what you named your Table of Contents above. Repeat the above for each and every location where you want to provide the reader a clickable path back up to the ToC. Remember to save your Word file. The next post is the last in the Smashwords series, and we look at Front Matter and End Matter.